Inside: Tired of food going bad before you can use it all? Or maybe you want to save time. 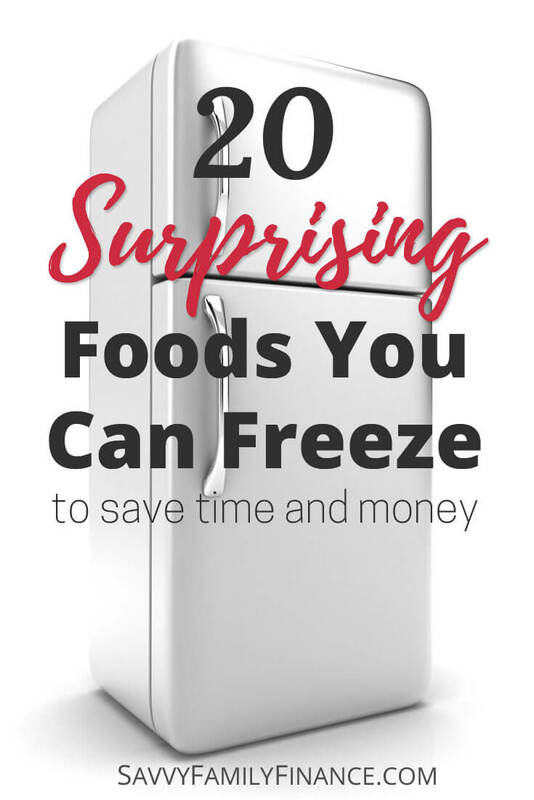 We have a list of foods you can freeze that you may not have thought about freezing before. How many times have you had a sad, shriveled ginger root sitting on your counter? Wouldn’t it be nice if there was more foods you could freeze to save some time during the week? Or even just not let things go to waste. I have been there, done that. And like you, if there is something I can prep in advance to save time or buy in bulk to save money, I’m willing to try. While it is obvious you can freeze some foods because they are for sale in the frozen food aisle at every grocery store, others foods may not seem quite as obvious. Ginger is a food that is handy to have around but it seems to go bad before it actually gets used. Solution? Wrap it tightly in foil and freeze it. I also put it in a freezer bag for extra protection. When you need some, you can easily grate it while it is still frozen. Do you ever find a good deal on bread but are afraid of it going bad before you finish the loaves? Bread freezes quite well. One way we save money is by stocking up on bread from the local bakery outlet store and keeping the loaves in our chest freezer. You know those little cans of tomato paste? Why do they come in that size when most recipes only want 2 tablespoons? I mean, really. But, you can freeze the extra tomato paste. Try putting it in a freezer baggie and flatten, which makes breaking off bits easy. Or, you can invest in a silicone tray where the impressions measure 1 tablespoon. These trays are also useful for candy-making. Do you ever feel rushed in the morning and would like to just grab a smoothie and go? Or maybe have an easy snack ready for the kids? You can make a large batch of smoothies and freeze them. The night before you need them, move them to the refrigerator to thaw. Give them a little shake before drinking and you are set. Garlic is my new favorite food to freeze. We eat a lot of garlic at our house. But honestly, the peeling and mincing all the time is bothersome and the jarred garlic doesn’t taste great. We found larger bags of peeled garlic cloves at the grocery store for a fair price. You can drop the cloves slowly into an already spinning (that is important!) food processor for instant minced garlic. Then, here is the great part. I bought this silicone tray where the impressions measure 1 teaspoon, or roughly 1 clove of garlic each. I fill each mold with garlic, pour in a bit of water then freeze. A couple hours later, I can pop out teaspoon sized mounds of frozen garlic and store in a freezer bag to grab as much as I want when needed. Many cookie doughs are freezable. Just put together the dough, measure out mounds onto a cookie sheet, freeze, then put the mounds into a freezer bag. When you are ready for some cookies, grab what you need and bake them. No thawing needed. Speaking of cookies, have you ever had a big cookie baking session with the kids and then wondered what you were going to do with all of them? Once they cool, put some in the freezer for another day. When preparing freezer meals, you might want to put pizza on the menu. You can get the pizza dough ready and then freeze it. The night before you plan to make the pizza (or in the morning when you wake up), put it in the refrigerator to thaw. When you are ready, put it on the counter to warm for 30 minutes then stretch it out and assemble your pizza. Dry beans are cost effective and shelf stable. They also take a couple hours to cook. So, when you have time, you can prepare a large batch of beans, then freeze them with their liquid. Put about 2 cups of beans in a freezer bag to equal one can of beans. Did you know you can freeze egg whites? They may not whip up quite as high, but I’ve never had a problem with them. Every year I would get frustrated when making my favorite eggnog recipe. It calls for 12 egg yolks and throwing out a dozen egg whites seems wasteful and we’d never get around to actually using them before they went bad. Then I remembered that angel food cake calls for a dozen egg whites. So, we now freeze the dozen egg whites in the winter when making eggnog and thaw the whites in the spring when we want angel food cake. No waste! Of course, you don’t need to save 12 at a time. You can use an ice cube tray to freeze individual egg whites. Did you know tofu is freezable? It will become denser when thawed but is still great in recipes. The denser texture may even be desirable for stir-frys. If you ever have bananas sitting on the counter getting overripe, you can slice and freeze them. It makes for a great addition to smoothies or you can thaw and use them later in other recipes. If you have more tomatoes than you know what to do with and don’t care for canning, then freezing is a great way to preserve tomatoes. You can blanch them in boiling water, cool and freeze them. They will lose texture in the freezing process, but the flavor is retained. These are great to use for chilis and sauces. Did you know you can extend your produce scraps by saving them for stock? Keep a bag in the freezer for clean vegetable scraps such as onions, onion skins, carrot peelings, celery leaves and ends, mushroom stems, and more. However, don’t include cruciferous or cabbage related foods like Brussels sprouts. When you have about 4 cups of scraps, you can pull it out and make homemade vegetable stock. And, of course, you can freeze the stock. Have you ever seen the pre-chopped onions at the grocery store? You can do it at home as well. Chop onions for cooking and freeze them and you can pull out as much as you need when you need it. Often we buy nuts for snacking or cooking but don’t finish the bag before the nuts start to turn rancid. But, you can freeze nuts and that is exactly what we do now to preserve them. Love steel cut oatmeal but don’t love the time it takes to cook? Try making a large batch and freeze portions in silicone muffin cups. Once frozen, they pop right out and you can store the portions in a freezer bag to use when you wish. Are you up to your eyeballs in zucchini this season? You can shred the zucchini and freeze it to use later in bread, fritters, or more. You can freeze cheese, though the texture does change when it thaws. Thus, freezing cheese is best reserved for harder cheeses that you will use for cooking. We sometimes buy larger bags of shredded or sliced cheese and freeze smaller portions to use later. Do you have recipes that call for the zest of a lemon, lime or orange? The next time you have the fruits around, zest them and freeze it for later use. It keeps up to three months in the freezer and is great to brighten up your cooking. Even if you don’t have an extra freezer, many of the smaller items can be frozen and stored in small attached freezers to reduce waste and save time. Combined with meal planning or making freezer meals, it all makes weeknight cooking less hectic. Are there any foods that you freeze that most people wouldn’t think of freezing? Thanks for this! I already freeze bread (such a stress reliever, otherwise I would be worrying that the bread would go bad!). I didn’t know you could freeze egg whites or tofu!